SQL Password changer software is a type of software recover and resets password of SQL database file. 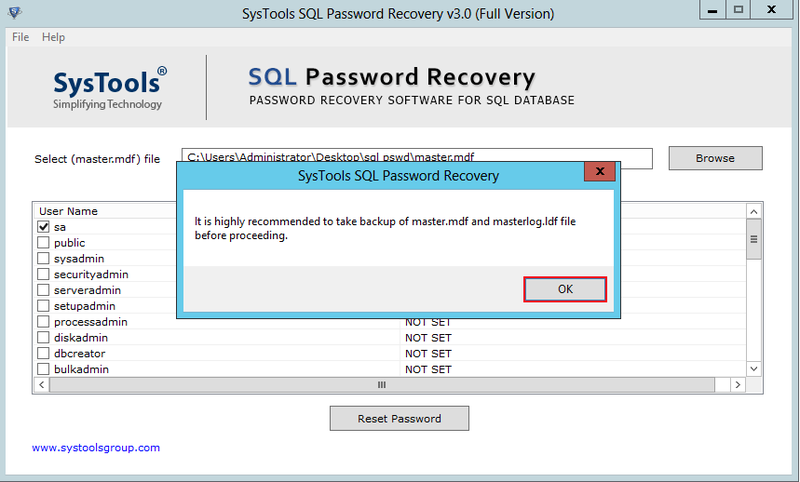 The SQL Password restore software is reliable and efficient at recovering SQL file password of any type and length. Moreover, allows users to reset the multilingual password for SQL file. 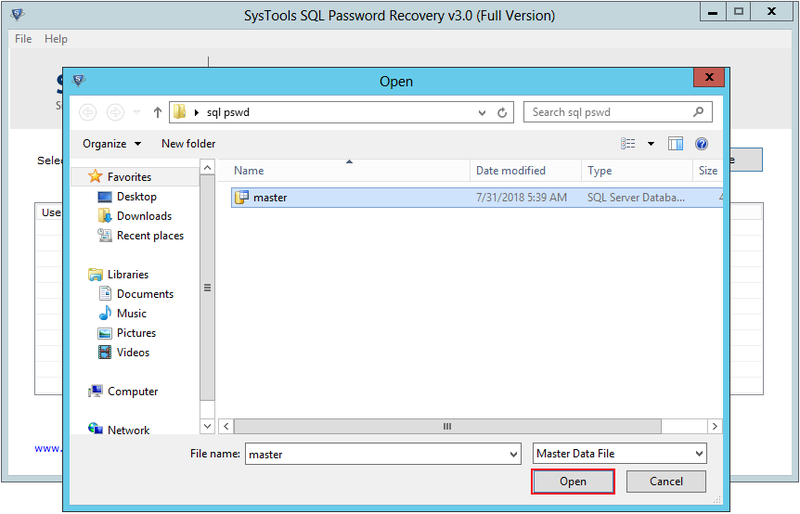 One can use this amazing SQL server database password removal to recover and reset the password from SQL Server database file. Moreover, the tool resets the password and stripped out from the file. Therefore, a user will no longer require user ID & password to open the SQL database file. After loading master.mdf file, SQL Password Changer tool will display the list of entire users created in that particular SQL Server. However, it displays all the usernames and associated passwords as "Unknown" or "Empty". If the password is encrypted then it shows UNKNOWN and if there is no password set then it displays EMPTY. It can also be possible that the SQL Server may have multiple users accounts with a different variety of passwords. 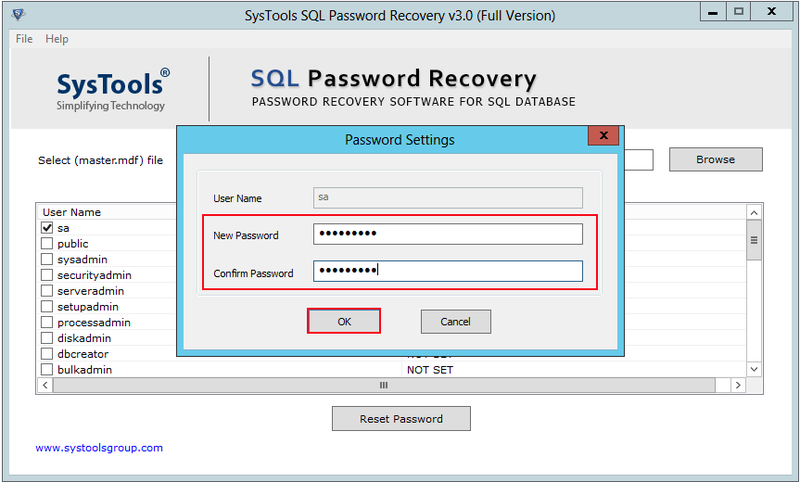 Therefore, one can use this SQL Password Restore software that can recover and reset all type of SQL passwords with any length. In addition, a user is also allowed to reset multilingual passwords or passwords with some special characters. The SQL Password Changer tool loads all usernames and passwords of different user accounts. One can first check those user names and select between them for which he wants to reset SQL passwords. Moreover, a user needs to tick the boxes even if he wants to reset SQL Password of all the user accounts. As the reset process finished, a successful password resets alert message will be displayed. 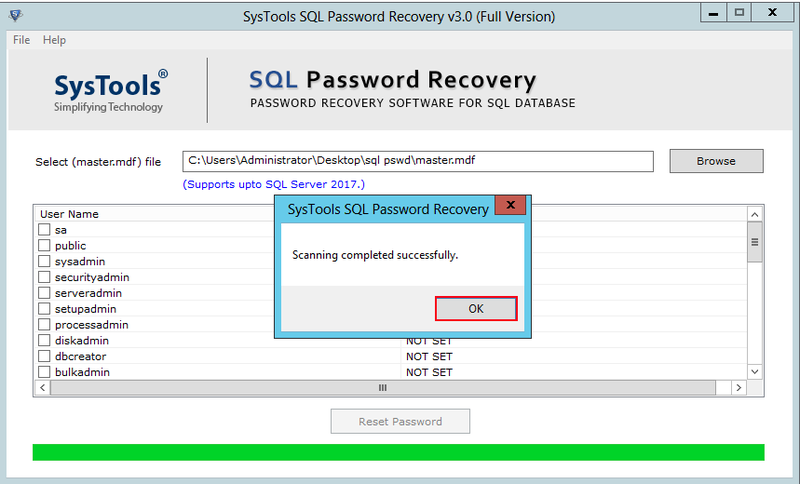 As SQL Password decrypt software is a single panel application that allows users to recover SQL password process on a single screen. In addition, the software provides such an easy-to-use interface that even a non-technical users can use this tool without any expert help. One does not has to make any extra navigations and can reset the password in just two easy steps only. 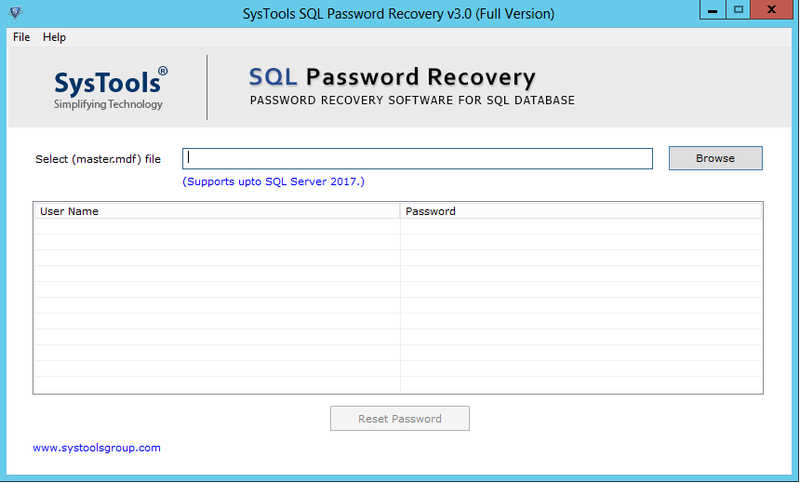 The SQL Password Restriction removal application permits users to restore SA password SQL 2012 and all other versions. 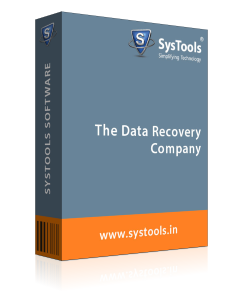 The System Administrator or SA password recovery enables immune the entire server from password protection that provides access to both the Database and to the server rules. 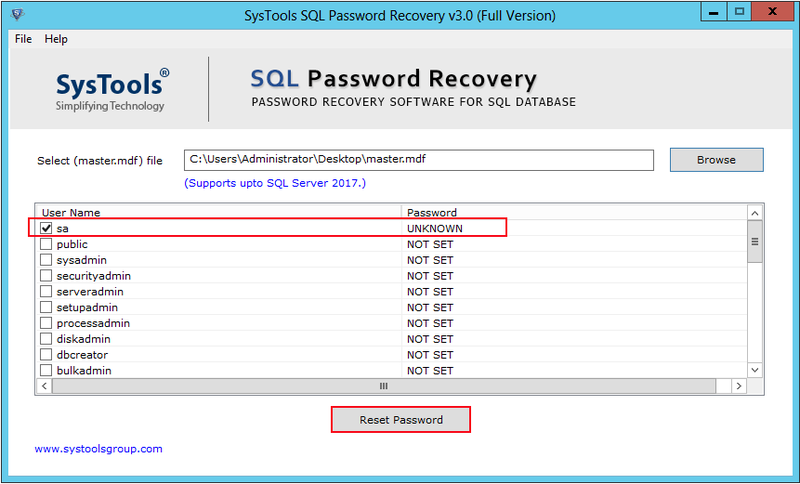 No, the SQL Password Reset tool will not detect the version of SQL Server under which database has been created. No, the software will remove or reset password from SQL database file with .mdf extension. Yes, a user can easily use this on any version of the Microsoft Windows, including Windows 10. Step 5 : The software will display the list of all users in that SQL Server and password column carries only two values i.e. Unknown: Means encrypted password and database. Empty: Means there is no password for the username. Select the user for which you want to reset the password and click on Reset button. Step 7 : Once you click on Reset Password the 'Password Setting', the tool allows you to set new password. Confirm it. Click Ok. Step 8 : Click Ok on, password Reset sucessfully dialog box. After using this software I am very happy as in just a few clicks, it allows me to get the password of SQL database file. The best part that I liked about the software is its easy-to-use interface that allows me to operate the tool without any hassle. 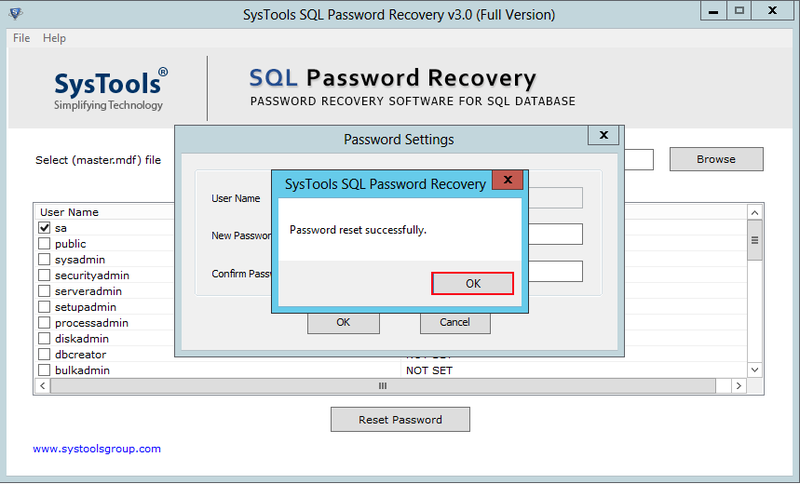 The SQL password Reset software is very much convenient for any individual to run and reset SA password SQL 2014 password. Thanks a lot! 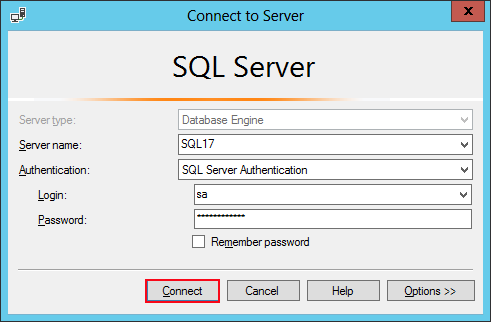 Sometimes working with SQL Servers gets difficult if you lose the password of the database. And I also faced that similar situation. But I must say thanks to this amazing SQL Password Changer software. Moreover, it reset the password in just no time and restore the password that seemed unknown to few just a few minutes before. Great effort was done by the development teams of the software.